What an amazing challenge for us at the National Painting and Decorating Show 2018. 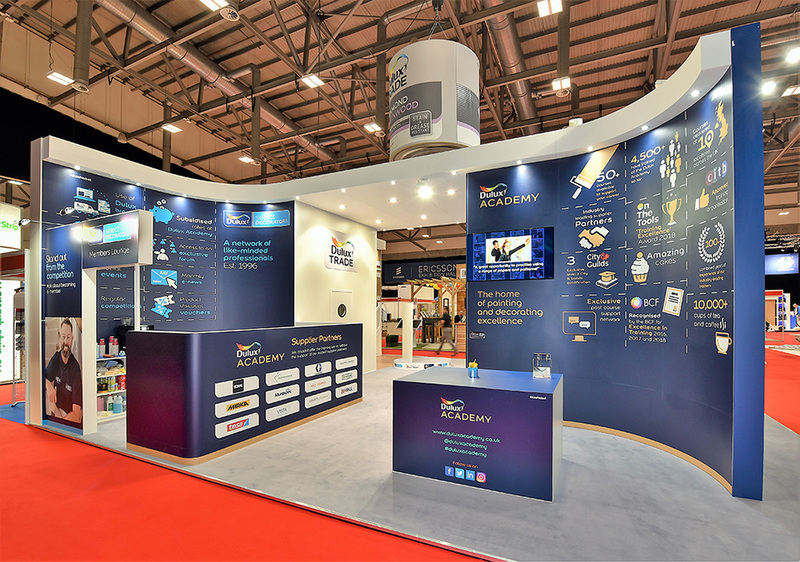 We were contacted by Exhibit R and asked to create a brilliant show stand – to include a whopping great big,revolving paint tin to be suspended over the stand! “Yes. Of course, we can”, we told them…then sat in the office wondering how we would build it! One of our immediate concerns was the weight of the paint tin, knowing that it was to be suspended directly over Dulux’s more traditional stand. It also had to be easy to install – as you can imagine there were 109 stands to be built, all on the same day, so there would be no special treatment for ours! Once we had done everything we could on the drawing board, it was time to bring the project to life. We created the main stand first. This was one of our more traditional builds, but beautifully curved and informative to mirror the quality of Dulux’s style and products. Then we set to work on the bonus feature of the suspended can. Our excited StandOut team gathered in the warehouse and began to construct the tin’s frame from aluminium – no easy task as it was over six feet high! Next, we printed the ‘coat’, or banner, using black backed material to stop light coming through. This keeps the colours vibrant, which, as you can imagine, is crucial for a paint company of Dulux’s prestige! How did it go together? Finally came the construction. The banner was stitched with silicone edging which was then pushed into the light metal framework, thus providing a seamless graphic. A base was printed onto lightweight Foamex and fitted in a rim at the base of the frame, to create a perfect – though enormous – replica of a tin of Dulux paint. On site, at the Ricoh Arena, we hoisted the can above the main stand and attached it to a rigged motor above the stand…then stood back and admired our work. See for yourself! This was a tremendous opportunity for StandOut Graphics to really showcase their skill and talent. Our stand for Dulux really did “stand out” at the National Painting and Decorating Show 2018! For the two days of the show, the huge can of paint stood proudly above all others and was a real centre point for this two day annual celebration of all that’s best in the vibrant painting and decorating industry. This was a superb project to have undertaken, and a challenge we thoroughly enjoyed. It proves that for StandOut Graphics, no challenge is too big!